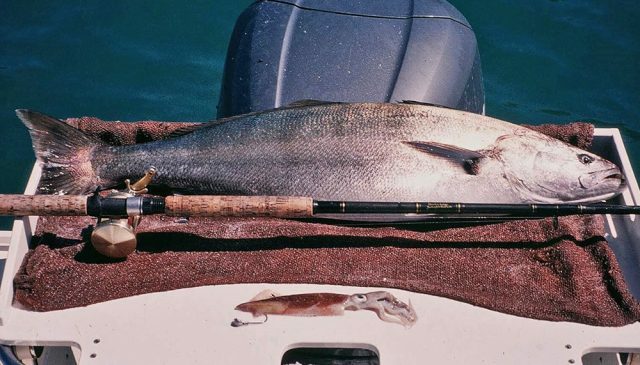 The first seabass I ever hooked at Catalina was in deep water on a flat calm night while anchored on the bait-grounds just below Silver Canyon. I cast out into the full-float that swirled around us and got bit soon after. The headshakes told the tale but it didn’t end well. My poorly tied and untested knot came untied…the curlicue at the end of my line was all the evidence needed. All the other seabass we caught from under the bait ball that night were 40-60 pounds. I was only 14 and got off the boat heartbroken and humbled but resolved. Flash forward through the collapse of the seabass fishery in the late 60’s and 70’s to the start of their slow recovery in the 80’s. 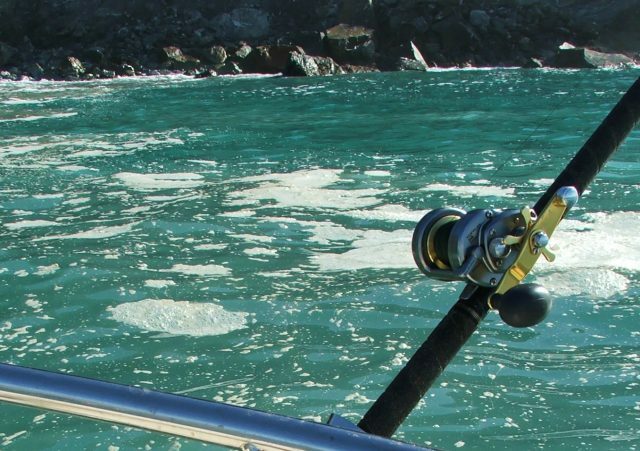 I was spending a huge amount of time on the water back then but mostly in hot pursuit of other species; calico bass, lingcod and marlin were top targets. Then we built a new 26’ Blackman in ’87 and my focus narrowed. It was mostly marlin during the offshore season and “Seabass or Die” for the rest of the year. I pursued both species with relentless passion. 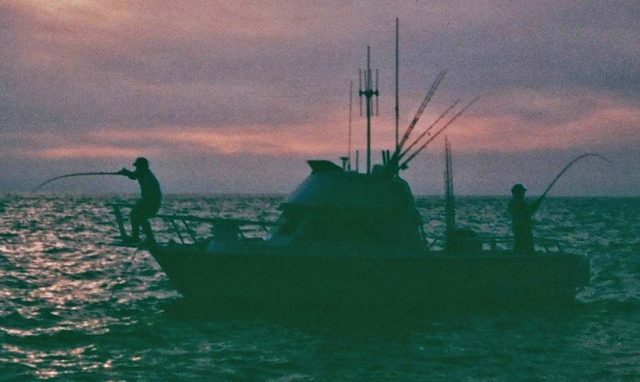 My Catalina quest started off with a matched pair of mid-twenties, from back to back casts, on the bait grounds very near where I had hooked that very first one oh so long before. Most of our fish from the first couple of seasons were from the deeper water on the bait or from the edges of structure and kelp lines. Information was very tough to get back then and there was way less fish than there is today. But I persisted in my desire to learn both the fish and how they related to the Island and how to target them in deep water as well as on the kelp lines and edges and ultimately up on the shallow beaches. And slowly it all started to come together. The average shallow water fish was about 10-pounds and easy to catch on light gear. It was a different fishery in the late 80’s. The population was increasing but the size of our average fish was way less than today. It made them much easier to land which helped me to gather data. I was fishing a lot back then, focusing my efforts on learning the shallows, and taking volumes of notes after every trip. I fished hard and studied harder. I noted down everything. And slowly, as the years rolled by, I began to identify the subtle but consistent patterns that influence seabass behavior. It’s been the practical application of those ground-truths that have made it easier to be in the right place at the right time. This was one of our first big ones from 3 fathoms. Jon Anders from Sea Pro with a tanker pushing 50-pounds. 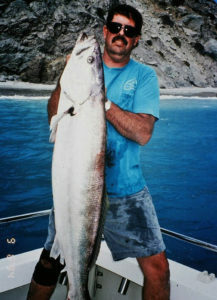 One of our customers once told me seabass fishing was easy; just anchor up somewhere and wait for them to swim by. He was a bright guy and made tons of money but I’m not so sure he was all that successful at fishing seabass. But many anglers do take that approach and if it works for you…it’s all good. But for me there is a better way. 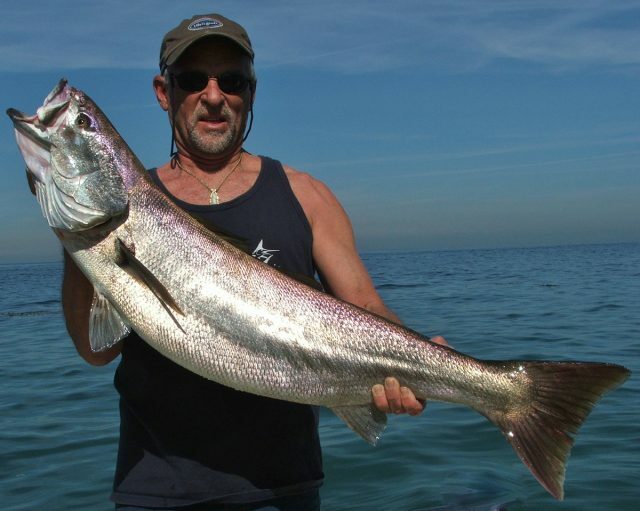 At this stage of a mature fishery just about everyone knows that shallow water seabass like that milky off-colored water. 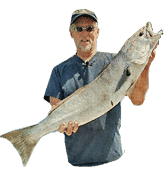 So if finding seabass was as simple as fishing dirty water just wait for the first big south swell of the season and when the whole Island gets washed out and dirty you should be able to just load up. Not even… I’ve never found the broad-brush approach to be effective. You need to narrow your focus. If I go rolling out of the harbor to fish calico bass on a favorite rock or wreck it’s a pretty safe bet the fish are on or near the spot. They may or may not be biting depending on conditions but they are there. They just don’t move around much. It’s not like that when fishing seabass. They are a highly mobile species and will hang tight when conditions are to their liking and they are gone when they’re not. When seabass are up shallow they like stable conditions, current, a nearby refuge, lots of food availability and the cover to successfully stalk it. They don’t like unstable conditions, lack of food, minimal or no cover and boat noise or traffic. When it comes to the specific spots here’s the mantra… and you need to memorize it, believe in it and then practice it religiously. A set of perfect conditions on a nothing spot but they were biting!!! Here’s a perfect example. Over my years at the Island I’ve had the time to focus on many different beaches on both the front side and back side. I took the time to study them and learn why the fish would be there when conditions were right. And to learn when it was that those all-important conditions might be right. The trick is to get there and get set up and chopping and chumming (if necessary) as conditions are changing in your favor. Then when the fish move in you’re in perfect position to take full advantage. So on a recent trip we started on a deep spot just to do a quick check and it didn’t look good. But the current direction was right for somewhere else so we made a several mile move. Timing was perfect with the all-important moon/tide connection and from a good way off I could see it was looking good. We crept into position and eased the anchor over. The bass and sargo were biting full speed but it still took about 30-40 minutes before we hooked the first seabass. In the interim the current picked up, the dirty water started forming some lines of foam along the beach and it slowly eased out to the deep kelp nearby where the fish were hanging out in the shade. Once it was right the fish felt secure enough to leave the kelp and cruise the beach under cover from the bright mid-day sun. It went wfo with fish to 35-pounds and then backed off as the current died, the water cleaned up and then before long it was over. And the important thing to note is that it was not just about the spot but about the conditions that surrounded it. The above is just a very short course in fishing beaches. 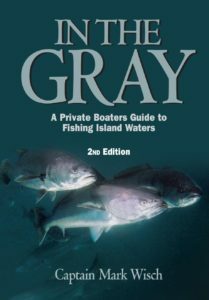 There is much more to learn and if you want the whole story, get a copy of Mark’s classic book “In the Gray”, A Private Boater’s Guide to Fishing Island Waters. 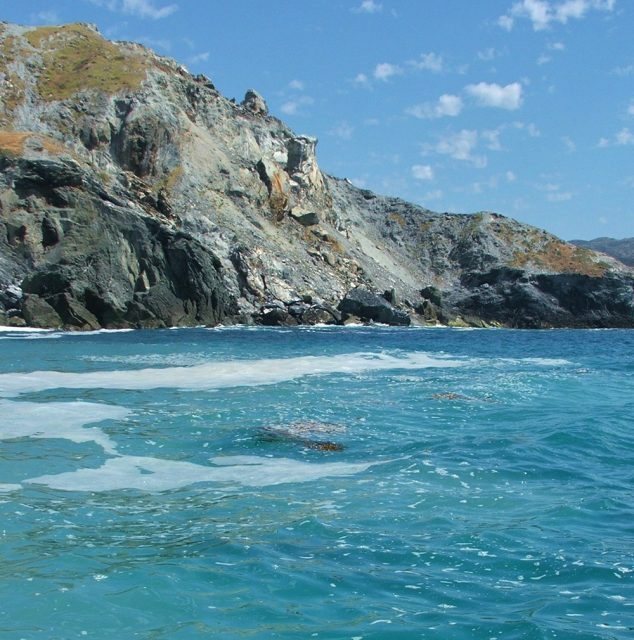 This book is 500 pages of exactly how and where to fish Catalina Island for the four major species; calico bass, halibut, yellowtail and of course the magical and mystical white seabass. You can stop by the Pacific Edge store or order on the web at www.PacificEdgeTackle.com. Pat Harrington and myself on my Blackman…just off a shallow backside beach. It was full speed and they bit right into the dark.